I’ve begun working on my next Lego project. I’m pretty happy with the way that Thomas has turned out so it’s time to make him a friend, Annie. 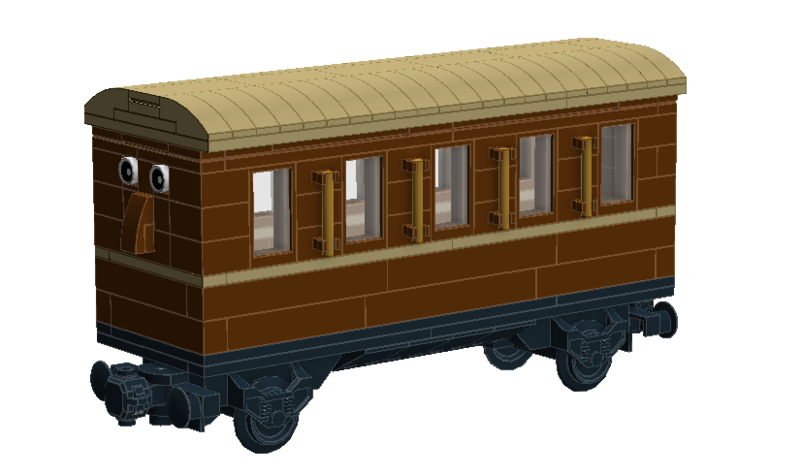 Also I need a carriage to contain the power and RF receiver for the Powerfunctions. This is the first project that I completely designed in Lego Digital Designer first before building in Lego. Previously I would create some prototypes with the blocks I have. I knew I would have many of the part that I might want and it would a fairly simple build. That is it’s pretty much a brown box on wheels. Quite early on I decided that Annie should be 7 bricks wide. There are two reason for this. Firstly her face, especially her nose, I wanted it to be centred in the middle. Secondary, I find it a little disappointing that with the Lego train sets that the interiors are often very basic and sometimes with sets just on one side. Going with 7 studs wide would allow for a gap of 1 stud to be at least a bit of a representation of a isle. The rest of the design is petty basic, I wasn’t really sure how or what detail to add to the sides. Looking a pictures online I’m assuming that Annie would have many doors along her side.